You asked - we listened. 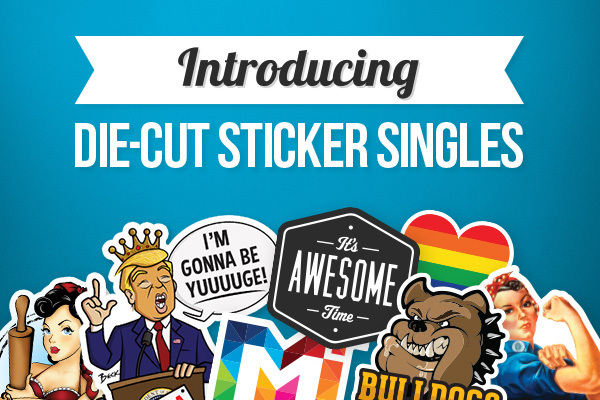 StickerYou is delighted to announce the launch of our newest sticker product: Die-Cut Sticker Singles. You can now order custom die-cut sticker singles online in any size, shape or quantity you like. What are Die-Cut Sticker Singles? Die-Cut Sticker Singles are individual stickers that are contour cut to the shape of your design. They differ from our Kiss-Cut Sticker Singles in that the backing of the sticker is also cut to the shape of your design. The end product you receive is a sticker fully cut to the shape of your design with no extra backing or material around the edges. These two products are both very popular and somewhat similar. Die-Cut Sticker Singles and Kiss-Cut Sticker Singles are both delivered as single stickers - not on sheets or rolls. Kiss-Cut Sticker Singles are more like mini sticker pages, where your sticker is contour cut around the design and can be peeled off the rectangular mini-page. Die Cut Sticker Singles have a more premium appearance and are contour cut around the edge of the design. They are delivered as standalone stickers and are not part of a mini-page. When to Use Die-Cut Sticker Singles? Die-Cut Sticker Singles are a great promotional tool or “swag product”. Use them to promote your business or event. Give them away to customers or sell them as merchandise. 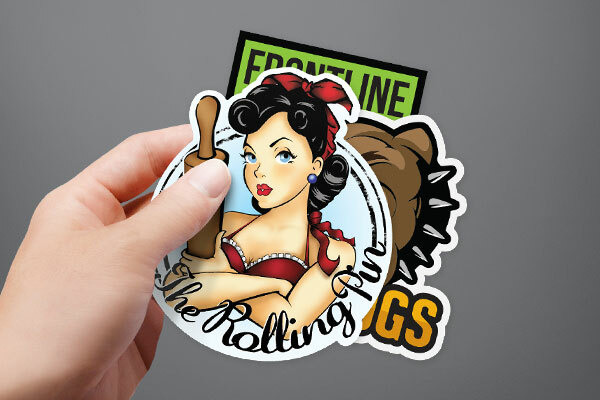 Die-Cut Sticker Singles are made of a durable vinyl material that is about 6 mil in thickness (around 0.15 mm). This is about the same thickness as a thick piece of paper. Die-Cut Sticker Singles are water-resistant and weather-resistant, however, are not dishwasher safe. They are abrasion resistant and UV resistant making them suitable for use outdoors. These stickers have a durable but removable adhesive allowing them to stick well to most smooth surfaces, but can be removed without leaving any gunk behind. Die-Cut Sticker Singles have a thin border around the edge of the design. This border is called “padding”. The padding is roughly 1/10” thick and helps to prevent the cutting machine from cutting into your design. Padding will vary very slightly from sticker to sticker. It is possible to create a bleed on you die-cut singles, which would remove the white padding. To do this, simply extend your background color image past the orange bleed line in the Sticker Maker. 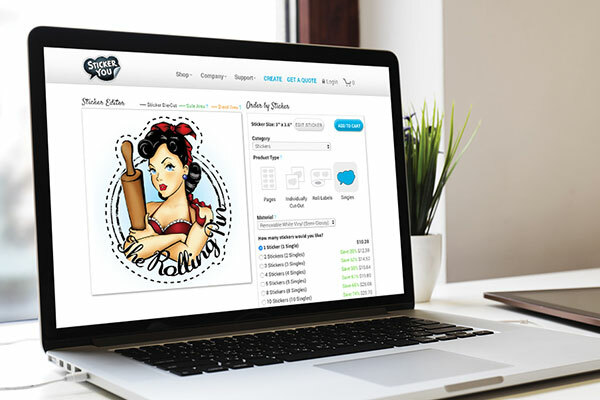 To order your custom die-cut sticker singles, simply upload your artwork or choose artwork from our gallery. Choose the size of your stickers and the quantity. There is no minimum order quantity for this product, you can order as little as one die-cut single sticker. Die-cut sticker singles will be printed, cut and shipped within 4-5 business days. With standard shipping time, your order will arrive in 8-10 business days or less. Your die-cut sticker singles will be bound and shipped in stacks, allowing for easy unwrapping and distribution. To apply your die-cut sticker singles, all you need to do is gently peel off the paper backing of your stickers, starting at one edge. You will get best results by sticking the middle of the sticker to your surface first and pressing outwards across the edges of your sticker. Smooth out any bubbles by using a credit card and smoothing sticker from the middle outwards. 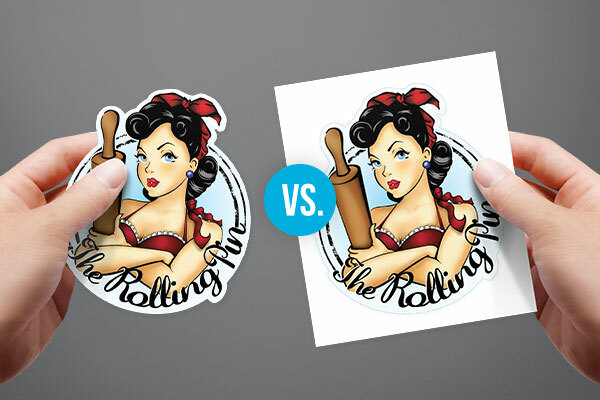 Die-cut sticker singles should remove cleanly from any smooth hard surface, except paper surfaces. Gently pick at the edge of your sticker, lifting the edge with your fingernail - then slowly peel the sticker off the surface. Please note, die-cut sticker single stickers are removable, but not reusable. Order your Die-Cut Sticker Singles today! StickerYou blog posts are written and published by StickerYou Crew members from our headquarters located in the beautiful city of Toronto, Canada. Get other great ideas, inspiration and sweet deals delivered right to your inbox by signing up for our newsletter here, or follow @StickerYou on Facebook, Twitter, Instagram, Pinterest, Google+ and YouTube.